Akagi, A., Jiang, C. and Takatsuji, H. (2015). Magnaporthe oryzae Inoculation of Rice Seedlings by Spraying with a Spore Suspension. Bio-protocol 5(11): e1486. DOI: 10.21769/BioProtoc.1486. 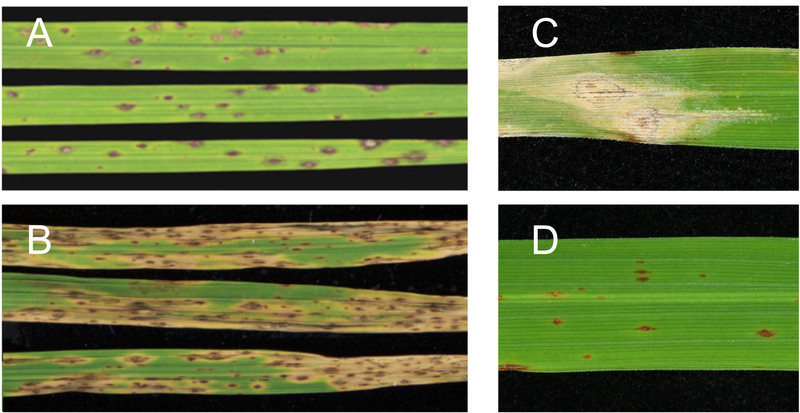 Fungal blast caused by Magnaporthe oryzae (M. oryzae) leads to a serious yield loss of rice. Appropriate assessment of disease occurrence is necessary to investigate the nature of the disease and plant strategies to resist the disease. 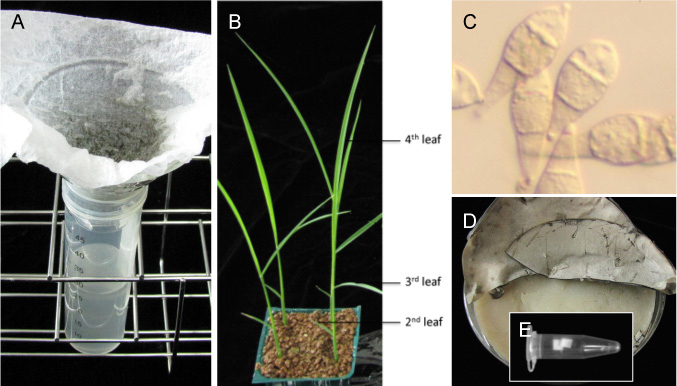 We describe our assay method of disease severity of M. oryzae on intact rice leaves grown on soil. Grow M. oryzae by placing a stock piece (Figure 2E) on an oatmeal agar plate at 26 °C for 10-12 d.
Transfer the plate to 24 °C and incubate for 3 d under a black fluorescence light to induce conidia formation. 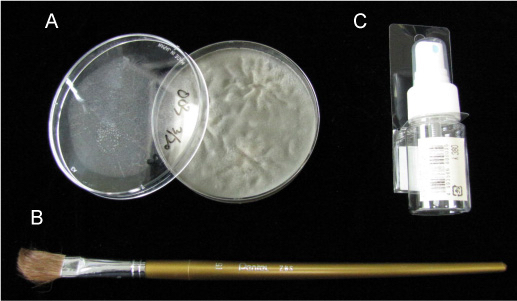 Pour about 20 ml of sterilized water into the plate (Figure 1A) and collect fungal conidia using a painting brush (Figure 1B). Filter the fungal conidia through KimWipe in a glass funnel set on a 50-ml conical plastic tube (Figure 2A), and determine the concentration of conidia in the filtrate with Hemocytometer under a microscope (Figure 2C). Figure 1. A. M. oryzae grown on an oatmeal agar plate. B. Painting brush used for collecting fungal conidia. C. Sprayer used for spraying the conidia. Soak rice seeds in water at 30 °C for 1 d in the dark and then sow them in a pot of soil (Bonsal No.2), and leave the pots in a greenhouse at 28 °C in the day and 23 °C at night for 10-14 d. Rice seedlings at four-leaf stage (three true leaves; Figure 2B) with fully expanded top leaves give the best results in this assay and the duration until reaching this stage varies with different seasons. At least ten rice seedlings are required for each infection assay. Suspend the conidia in 0.02% Silwet L-77 (or 0.05% Tween 20) at a density of 105/ml (in summer) or 1.5 x 105/ml (in winter) and spray them onto rice plants until the uppermost leaf is completely wet (Video 1). After incubation in a dew chamber at 24 °C for 24 h, move the rice plants back to the greenhouse. After 5-7 d of infection, count the number of blast lesion of susceptible-type in unit length (e.g., 10 cm) of the fourth leaves (Figure 3A, 3B and 3C). In the case of too many blast lesions formed to distinguish and count (Figure 3B), determine the amounts of M. oryzae 28S ribosomal DNA relative to rice ubiquitin 1 (Os06g0681400) by qPCR (Qi and Yang, 2002). Figure 2. A. Filtration of conidia. B. Rice seedlings at 4-leaf stage. C. Spores under microscope. D. M. oryzae grown on a filter paper placed on an oatmeal agar plate. E. Filter pieces with M. oryzae grown on in a 1.5 ml-Eppendorf tube. Figure 3. Blast lesions on rice leaves. A. Lesion number appropriate to count. B. Lesions too many to count. C. Susceptible-type lesions. D. Resistant-type lesions. Place a piece of sterile filter paper on an oatmeal agar plate. Transfer a small piece of M. oryzae mycelium grown on another oatmeal agar plate onto the filter paper. Grow M. oryzae on the filter paper at 26 °C for 10-12 d until fungal hyphae covers all over the filter paper (Figure 2D). Take out the filter paper with grown M. oryzae hyphae (Figure 2D), and dry it for 1-2 d in a petri dish with silica gel (Figure 2E). Cut the filter paper into 5 mm square pieces and dispense 2-3 of them together with 2-3 silica gel into a 1.5 ml-Eppendorf tube, then keep the tube at -20 °C until use. It seems that the incidence of blast disease varies seasonally; higher in the summer and lower in the winter. So it is necessary to adjust the conidia density accordingly, e.g., 105/ml in summer and 1.5 x 105/ml in winter respectively, in order to keep the reproducibility of the assay (Akagi et al., 2014). The induced conidia on the oatmeal agar plate can be stored in a refrigerator (4 °C) for at least 2 weeks without appreciable loss of pathogenicity. The M. oryzae stocks can be stored at -20 °C for several years. This work was supported by a grant from the Ministry of Agriculture, Forestry, and Fisheries of Japan (Genomics-based Technology for Agricultural Improvement, GMO1006b). Akagi, A., Fukushima, S., Okada, K., Jiang, C. J., Yoshida, R., Nakayama, A., Shimono, M., Sugano, S., Yamane, H. and Takatsuji, H. (2014). WRKY45-dependent priming of diterpenoid phytoalexin biosynthesis in rice and the role of cytokinin in triggering the reaction. Plant Mol Biol 86(1-2): 171-183. Qi, M. and Yang, Y. (2002). 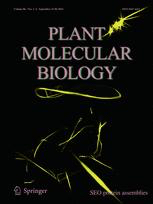 Quantification of magnaporthe grisea during infection of rice plants using real-time polymerase chain reaction and Northern Blot/Phosphoimaging analyses. Phytopathology 92(8): 870-876. How to cite: Akagi, A., Jiang, C. and Takatsuji, H. (2015). Magnaporthe oryzae Inoculation of Rice Seedlings by Spraying with a Spore Suspension. Bio-protocol 5(11): e1486. DOI: 10.21769/BioProtoc.1486. Just wondering if you know whether they used the 50ml inoculum os spores until run-off or just until all the leaves are fully covered. Also, I'm unable to count the exact number of plants they had on the tray. Can you please confirm me if they are around 16. I just want to be able to replicate the method as close as possible.